One ingredient swaps that will save you hundreds of calories (not to mention fat and sugar) this season. Indulgent meals are a given this season. But those of us trying to eat healthfully (and not enter the new year with a few extra pounds) don't have to avoid the treats entirely. Instead of depriving yourself (or throwing in the towel and going whole hog on the cookie tray), use these one-ingredient swaps to shave off hundreds of calories from your holiday favorites — without sacrificing any flavor. When the breadbasket comes around, opt for the smallest end piece, not the largest middle piece. Then spread it with a teaspoon or two of roasted garlic, instead of the same amount of butter. (To make it, just cut the top off a head of garlic, drizzle a little bit of olive oil on top and pop it in a 400-degree oven for a half hour!) You'll cut calories and fat and add a lot more flavor. Lower the calories in your favorite spinach dip recipe by swapping the cream cheese or sour cream for plain fat-free Greek yogurt. “You get more protein and some calcium — and save on calories and saturated fat,” says Christy Brissette, MS, RD, owner of 80 Twenty Nutrition in Chicago. Reduce calories even further by trading crackers and bread for sliced carrots, bell peppers and zucchini. Rather than glazing your ham with a sugar-packed sauce, halve the sugar and add some low-calorie sweet spices like cinnamon. Here’s a mac-and-cheese swap you likely don’t know about: Replace up to half the cheese sauce for pureed yellow split peas. In addition to lowering the calories, you’ll take in more fiber, helping to keep you fuller for longer. Festive holiday cocktails tend to be loaded with sugar, but they don't have to be. “Swaps are about more than just saving calories,” says Dawn Jackson Blatner, RDN author of "The Superfood Swap." She recommends trading a Moscow Mule mixer (with up to 6 teaspoons or more added sugar per serving) for a gingerade Kombucha, typically with no added sugar. “This swap also gives you gut-friendly probiotics to boost immunity and aid digestion,” she says. 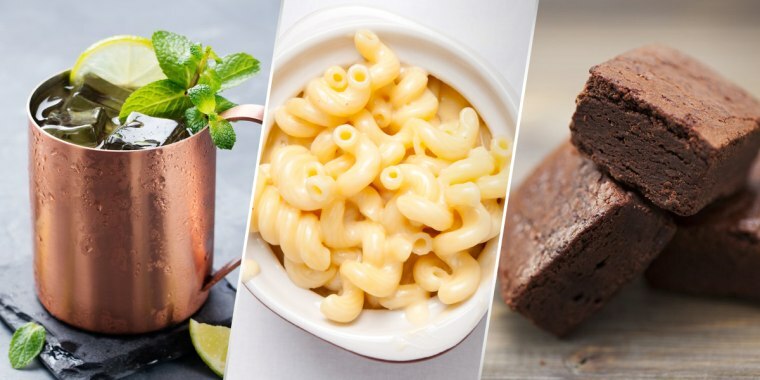 “Delicious in recipes like red velvet cupcakes, brownies or gingerbread muffins, use a one-to-one ratio of avocado to butter,” advises Marisa Moore, MBA, RDN, owner of Marisa Moore Nutrition in Atlanta, Georgia. “That means that for every 2 tablespoons of butter swapped, you’ll save 150 calories.” Make the same swap for shortening, and you’ll save 180 calories! Simply swap half the butter for low-fat or fat-free plain Greek yogurt in your favorite muffin or quick bread recipe — or whip up a muffin recipe already featuring Greek yogurt and less butter. Then reduce the sugar by a quarter and add ¼ teaspoon vanilla extract. Pancakes are a must for holiday breakfasts, but save some calories — and add filling protein to your meal — by topping your stack with a runny egg instead of a quarter cup of syrup. Even veggies can use a makeover: Skip the oil, instead sautéing veggies (think onions, mushrooms and more!) in low-sodium vegetable broth.